From Calafate north to Perito Moreno and Bariloche, the authorities have now paved the way for travellers on national route 40. In the ensuing decades, I’ve gotten to know “La Cuarenta” in a more agreeable fashion, driving nearly every paved and unpaved kilometre of it (except for the very highest segments in Salta province). Most of my travels, though, have been on the Patagonian portion between El Calafate (in the south) and Bariloche (at the north end). In the course of it all, it’s been gratifying to observe the changes – mostly but not always improvements – in that time. Most often, I’ve driven the route from south to north, as summer becomes autumn, but it’s possible to do it in either direction during most of the year. It doesn’t have quite the same cachet as Chile’s roughly parallel Carretera Austral, which traverses rugged mountains and dense forests, but Argentina’s Patagonian steppe has its own appeal – including plenty of wildlife, most conspicuously guanacos and rheas. When I first drove it, in the summer of 1991, we saw only four other vehicles, in three days, between El Calafate and the town of Perito Moreno (not to be confused with the Perito Moreno glacier). El Calafate, of course, is one of Argentina’s highest-profile destinations but, for our purposes here, it’s merely a place to fill the tank. That’s a recurring topic here because, though the road is light years better than it was in 1991, fuel availability is still limited. Carrying a 20-litre bidón is advisable, as stations sometimes run out and deliveries can be irregular. In fact, El Calafate lies about 30km west of RN 40, which heads north across the Río Bote and follows the eastern shore of Lago Argentino and the Río La Leona. About 80km beyond the junction, the Parador La Leona is a renovated roadhouse that’s become an obligatory stop for buses between Calafate and the “trekking capital” of El Chaltén. Dating from 1894, Le Leona has gentrified since its acquisition by the Kargauer family of Buenos Aires, whose cinema connections even brought a visit by Francis Ford Coppola. I usually grab a factura, but there are also respectable accommodations – though cyclists and transient tourists are now the clientele, rather than gauchos and sheep ranchers. Along the shores of Lago Viedma, another 20km north is the turn-off to El Chaltén, but that’s more than an hour away to refill the tank. Fortunately, it’s just 34km more to the enigmatic Tres Lagos, a town with fuel but no lake within at least 30km. Not much to see here, but the YPF station serves delicious lamb empanadas and there’s a fine municipal campground. To the north, it’s another 100km or so, over rolling steppe where work continues on paving the road, to Lago Cardiel and the oddball Estancia La Siberia, another roadside attraction where long-distance buses – which operate daily in the summertime – often make a pit stop. There are simple accommodations here, and fishing at the lake. About 30km to the north, there’s a decision to be made. When the Kirchner administration decided to pave the entirety of RN 40, they chose to reroute the highway east to the town of Gobernador Gregores, but that doubled the distance of the former route – now Ruta Provincial 29 – whose 67km of (usually passable) gravel still provide a glimpse of what nearly the entire route used to be like. Gregores, though, offers the only fuel until the hamlet of Bajo Caracoles, more than 200km farther north. Personally, I prefer the shortcut, but the paved option to Gregores – which also has accommodations, restaurants and other services – doesn’t add that much in time. It also features a memorial to victims of the 1921 military massacre recalled in Osvaldo Bayer’s novel Los Vengadores de la Patagonia Trágica and depicted in Héctor Olivera’s subsequent film La Patagonia Rebelde. At the northern junction of the gravel road and the paved highway, it’s also only about 30km to Hotel Las Horquetas, another rehabbed roadhouse that’s not quite at the level of La Leona, but definitely worth consideration. Farther up the road, though, there’s a recommended turn-off to Parque Nacional Perito Moreno (again, not the Moreno Glacier). Here, one summer night in 1990, we were the only visitors in the entire Andean park, camping on the shores of Lago Burmeister, surrounded by a herd of guanacos. Its Cerro León is a magnificent site for condor-watching, and there’s accommodations and camping at Estancia La Oriental. Ideally, this would be a two-night detour. From the turn-off, it’s another 101km to Bajo Caracoles on a stretch where, in 1990, we lost first and fourth gears on my father-inlaw’s aging Peugeot 404 truck, which we weren’t able to repair until Bariloche. Bajo Caracoles is notable for its namesake hotel – another classic roadhouse with a handsome façade of stone blocks – and a service station where the fuel often runs out. The accommodations are decent, and there’s also a small grocery within. Bajo Caracoles is also, however, the main gateway to the UNESCO World Heritage Site of Cueva de las Manos, 50 km northeast by the gravelled Ruta Provincial 101. This is a must-see detour for the colourful pre-Columbian images in rocky overhangs – they’re not really “caves” – above the Río de las Pinturas canyon. 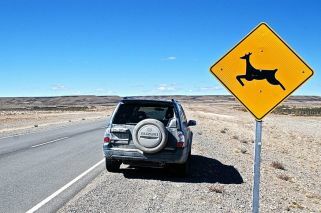 It’s not just hands, as there are also stick figures (analogous to Kokopelli of the southwestern United States), and fauna, most notably guanacos. La Leona Roadhouse and Country Lodge (www.hoteldecampolaleona.com.ar) is barely an hour from El Calafate, so it’s more a coffee stop than a place to stay, but the riverside setting is appealing and the restoration is admirable. There’s also camping, and the more elaborate Estancia La Estela (www. estancialaestela.com.ar) a short drive to the west. Estancia La Siberia (tel. 02966/15-352521 in Río Gallegos, jfquinteros@yahoo.com) is a drop-in spot with simple meals and accommodations. It has a Facebook page, but no dedicated website. Hotel Las Horquetas (tel. 02966/635294, laviejaestacion@gmail.com) is another nicely restored roadhouse, alongside the highway to the west of the northern junction with the old gravelled route. Parque Nacional Perito Moreno (Paseo 9 de Julio 610, tel. 02962/491477 in Gobernador Gregores, peritomoreno@apn.gob.ar) is an isolated gem of Argentina’s national parks system, well worth the 90 km detour off the main highway. Estancia La Oriental (www.laorientalpatagonia.com.ar) lies within Parque Nacional Perito Moreno, and has comfortable accommodations in the main house, as well as hostel housing and camping. Breakfast included for house guests, but extra for campers and hostellers. Hotel Bajo Caracoles (tel. 02963/490100) is an essential stop, if only for fuel and some provisions, but there’s decent accommodations behind the imposing stone façade. Cuevas de las Manos (www.cuevadelasmanos.org) is Patagonia’s legendary rock art site, and an absolute must-see. Guided tours are now obligatory—no roaming around the site—but the hike from the former. Estancia Cueva de las Manos, accessed from the north, adds an element of autonomy. The Fundación Flora de Fauna should soon reopen the facilities as a refugio, but visitors with their own vehicles can easily access the trailhead. In Perito Moreno itself, Zoyen Turismo (www.zoyenturismo.com.ar) arranges visits to Cueva de las Manos, including guided hikes. The Museo Carlos Gradin (Rivadavia 960) puts it all into context, while the Salón Iturrioz (Rivadavia and San Martín) is ideal for a break and a meal. At Chacra Kaikén Lodge (Hipólito Yrigoyen 2038, tel. 02963/432079, kaikenpm@gmail.com), Coco and Petty Nauta offer the same unpretentious hospitality they once did at Estancia Telkén, which they sold some years ago.